The 2013 workshop of the Ercim working group on Multimedia Understanding through Semantics, Computation, and Learning (MUSCLE), was held in Antalya, Turkey, on October 3rd and 4th. The meeting was attended by 28 scientists, and featured 22 contributed presentations and three invited talks: “Medical Image Analysis: Visual Decomposition and Modeling”, by Prof. Metin Gurcan of Ohio State University, USA, “2D and 3D object registration without point correspondences”, by Prof. Zoltan Kato of University of Szeged, Hungary, and “Intelligent user interfaces: practical considerations in design and implementation,” by Prof. Metin Sezgin of Koc University, Istanbul, Turkey. ERCIM and Keio University agreed on a joint effort to help ensure that the World Wide Web can meet the needs of the digital publishing industry. Through this collaboration, Keio University and ERCIM will support the internationalization work of the World Wide Web Consortium (W3C), which develops standards for Web technology, including HTML5 and Cascading Style Sheets (CSS). The expected outcome of the project will contribute to promotion and growth of the eBooks industry. It is with great sadness that we remember Professor Michael Wilson (Scientific Computing Department, STFC) who died suddenly and unexpectedly at the end of April. 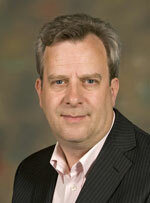 Michael joined RAL (Rutherford Appleton Laboratory) in 1986 after having been a researcher in psychology at Cambridge. He led a team of researchers who worked on user interface design and visualisation of scientific data. He also worked on projects concerning knowledge-based assistance to querying and explanation, and heterogeneous distributed information systems. His work on time-based media for the web was a major contribution to the SMIL language which later became the basis for the Multimedia Messaging System (MMS) used universally on mobile phones. He was also involved in work on web ontology languages, OWL and SKOS. Later, Michael became increasingly involved in promoting science and technology, managing the UK and Ireland office of the World Wide Web Consortium and leading the communications activities for e-Science. In his most recent role Michael was on secondment to the Department of Business Innovation and Skills, leading the work of the e-Infrastructure Leadership Council Secretariat. Within ERCIM Michael was well-known as an active member of the Executive Committee and project participant, contributing greatly to financial management, governance and the change to the new structure of ERCIM. Michael will be sadly missed by colleagues. Always good company, Michael was an accomplished speaker and had a remarkable ability to quickly identify the core issues in any discussion. ERCIM and Ideal-ist have established a cooperation to disseminate ICT partner searches with the objective to increase the participation of ERCIM member organisation in the European Unition's ICT Programme. Read more: "ERCIM Ideal-ist partnership"
Latest ISTAG Report: "Software Technologies - the missing key enabling technology"
In it's latest report, the IST Advisory Group (ISTAG) - the advisory body to the European Commission in the field of Information and Communication Technology (ICT or IST) stresses that "missing the strategic importance of software technology as a key enabling technology will lead to a significant drawback for global competitiveness." Read more: Latest ISTAG Report: "Software Technologies - the missing key enabling technology"